A collection of reviews, recommendations and general beer commentary from a thrifty beer lover. Without all the snobby jargon. Looking back, this could easily be ranked the worst beer of the year, but as a low-carb light beer, that's predictable. So putting it at the top of the list would be boring. 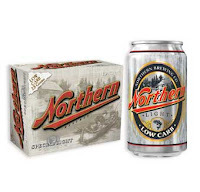 That said, Northern Premium Light was notably worse than even the worst beastly lights out there. At its original time of rating, I called it "the most tasteless beer to date." That was in August, and if my memory serves me correctly, I would still describe it that way. In fact, the brewer's website describes it this way: "This beer is a lightly hopped beer with low body and a pale golden color." Lightly hopped? Low body? Pale golden color? Not exactly the best PR work here. And no, you can't buy a single bottle of this beer, though I've paid more for an individual bottle many times than I had to pay for an entire case of this. There's your sign. Unfortunately, I had to offer this swill to my father-in-law after an evening of manly labor, something I was admittedly embarrassed doing. When I asked him what he thought of it, he said, "It's cold." That's really the best you can do. There are, as in the case of Harbin, plenty of drinkers out there that can do a much more eloquent job of describing these beers, and I strongly encourage you to read a sampling of them at ratebeer.com. Since this is a year-end recap, I don't have all the flavors fresh in my mind, so I have to rely on my initial notes and hazy memory. In this instance, I was as terse as possible in my original rating. So again, I'll let the raters take over. heemer77: "Wow, this pours out of the can with a pale yellow that is not even straw. It’s like looking in a trough at a stadium and seeing the water washing away the urine. White scum of a head on top. The aroma is light vomit and corn flakes. There is also some petroleum based aroma, like motor oil. The taste is light corn flakes with a metallic finish." jpm30: "Strange, unappealing nose, even for a light beer, that apple juice scent that so many Gluek beers have, corn syrup, metallic fusel alcohol. Active carbonation without the light body, more medium, watery feeling. Unpleasant taste, weak, watery sour apple juice, the thinnest of sweet pale malts, hints of boiled sweet corn, used up, tasteless hops, finishes with a big taste of metal. There is also an artificial sweetener twang in the aftertaste, making you want to wash your mouth out." asedzie: "Aroma is rotting compost and a little bit of cigarette smoke. Flavor is light diacetyl with rotten vegetables. Watery palate. Putrid. Can’t think of any redeeming qualities to this beer." spelling is accurate. word is wrong.